Malana Bomb is an autoflowering Sativa-dominant strain with a small to medium sized stature but being very productive and can be collected in only 10 weeks. Malana Bomb is very easy to grow and is resistant to fungi.. This beautiful plant has its origin in the Himalayas, used as a plant to extract "charas". The term "charas" come from a type of hashish extracted by hand in the artisanal way of rubbing the colas full of buds with leather gloves. Barney's Farm has managed to bring us this yielder autoflowering version of hash and also managed to cross it with a small ruderalis genetics. In this way, Malana Bomb is a hybrid sativa-dominant strain. The stature of the Malana Bomb pulling is small to medium sized (between 50 and 80cm), with several side branches that will become fat colas filled with resinous flowers. Due to this structural feature, we recomend not gouping too many plants in the vegetative period so they can deploy their full potential; nonetheless, it is a strain suitable for reduced growing areas. 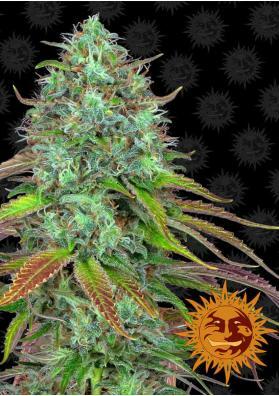 Like the majority of automatic strains, Malana Bomb is very easy to grow. Besides not needing too much fertilizer, it tolerates fairly well the excess or lack of fertilizers. Moreover, it is greatly resistant to fungus and diseases and is able to endure temperature changes, either hot or cold. The average yield of Malana Bomb ranges from 30 to 50 grams per plant. All this production comes from the buds and resin that accumulate along the branches so we recomend to give them some kind of support like meshes, bamboos or other options to prevent them to be damaged. The crop is ready to be collected after 10 weeks from germination. This feature makes it a great option for commercial growers. You can enjoy a great crop investing little time and effort. Once dry, the buds become tough and compact. Malana Bomb is a potent plant that not only has a high THC level (15%), but has also a quite high CBD level. The high is powerful and durable being mainly corporal. It is very relaxing and stimulates the appetite. Since it is leverage is a perfect choice to relax after a long day.